Building a cool play house for your kids is a snap thanks to to the Kids' Cottages by Bazoongi Kids. 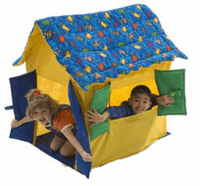 These play tents are perfect for young ones that enjoy "peek-a-boo". 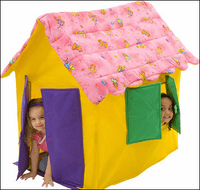 These colorful, durable tents feature soft windows and doors that open and close easily. The tents slide quickly on and off the fiberglass frame and connects to the detachable floor for easy assembly and clean-up. We will embroider your child's name above the door. For more detailed information regarding how we embroider please see the Personalization Page.